Before taking Folic Acid, DHA, Lycopene & Zinc Tablet we should need to know how they work individually. We know that Folic acid is water-soluble vitamin B9. Water soluble means it dissolves in water. Folic acid is a key factor for synthesis of nucleic acid, memory loss and Alzheimer’s disease. Docosahexaenoic acid (DHA) is an omega-3 fatty acid. It is found in cold water fatty fish, such as salmon. DHA plays a crucial role in the growth and development of the central nervous system. Lycopene is one of the most potent antioxidants in the diet and Protect your cells from the damaging effects of free radicals. Zinc is a trace mineral that has many roles in the body. It is necessary for a healthy immune system, and is also of use in fighting skin problems such as acne, boils and sore throats. It has been demonstrated by recent studies concomitant administration of an Folic acid, DHA, Lycopene and zinc tablet shows significantly better improvement of central nervous system, prostate cancer, mouth cancer, skin disease called vitiligo.with each of the treatment. 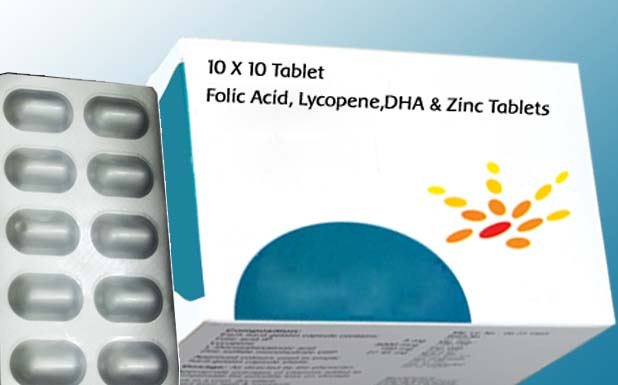 Combination of Folic acid, DHA, Lycopene and zinc tablet is used for preventing and treating low blood levels Folic acid is used for other conditions including ulcerative colitis, liver disease, alcoholism, and kidney dialysis. In this combination DHA is essential for the growth and functional development of the brain in infants. DHA is also required for maintenance of normal brain function in adults. It help in improvement of central nervous system. Lycopene helps to fight asthma related inflammation, diabetes, skin problems, and dental conditions like gingivitis.it is also useful for treating cancer like Prostate cancer Mouth cancer Skin disease called vitiligo It also help in Growth and maintenance of muscles. Folic Acid is water-soluble vitamin B9. Water soluble means it dissolves in water. It is carried through the bloodstream and excreted in urine. Folic acid is a key factor for synthesis of nucleic acid. Folic acid is used for memory loss, Alzheimer’s disease, age-related hearing loss, preventing the eye disease age-related macular degeneration (AMD), reducing signs of aging, weak bones (osteoporosis), jumpy legs (restless leg syndrome), sleep problems, depression, nerve pain, muscle pain, AIDS, a skin disease called vitiligo, and an inherited disease called Fragile-X syndrome. Docosahexaenoic acid (DHA) is an omega-3 fatty acid. It is found in cold water fatty fish, such as salmon. It is also found in fish oil supplements, along with eicosapentaenoic acid. DHA plays a crucial role in the growth and development of the central nervous system as well as visual functioning in infants. Lycopene is carotenoid which is present in tomatoes, apricot, pink guava, and watermelon. Lycopene is one of the most potent antioxidants in the diet and Protect your cells from the damaging effects of free radicals. Lycopene help to treat Cancer, especially prostate cancer, mouth cancer. Zinc is a trace mineral that has many roles in the body. It is necessary for a healthy immune system, and is also of use in fighting skin problems such as acne, boils and sore throats. It is further needed for cell division, and is needed by the tissue of the hair, nails and skin to be in top form. Zinc is further used in the growth and maintenance of muscles. In today’s busy life style and untimely food habits the Indian consumers are not able to take a balanced diet with recommended servings of fruits and vegetables i.e. do not get proper nutrition as a result they may become deficient of vitamins, minerals which may lead to deficiency and life style diseases. Today’s consumer does not have time for taking the three meals- breakfast, lunch, dinner at the healthy schedule due to long working hours in the office, pressure of work hence develop unhealthy food habits which may lead to deficiency of micronutrients. Thus nutritional deficiency is almost impossible to avoid in these modern times. With the busy lifestyles and the tempting convenience of fast food, it is now very difficult to enjoy excellent daily nutrition. As nutrients in their proper amounts are required for optimum health and since our diets most likely cannot provide all of them, nutritional/health supplements can fill in these gaps. Nutritional /health supplements are also useful in getting rid of the toxins which one is exposed to, as well as the lifestyle-these all subject one to harmful toxins which can lead to serious health problems. Lycopene is a powerful antioxidant (An antioxidant is a molecule that inhibits the oxidation of other molecules. Oxidation is a chemical reaction that transfers electrons or hydrogen from a substance to an oxidizing agent. Oxidation reactions can produce free radicals. In turn, these radicals can start chain reactions. When the chain reaction occurs in a cell, it can cause damage or death to the cell.so it is very useful to treat Cancer,and in the combination of vitamin B9 zinc and DHA it is very useful for growth and development of the central nervous system. Side effects of Folic acid, DHA, Lycopene and zinc tablet are most likely to be minor. ●Swelling on face, lips, tongue and throat. From the above discussion, it can be concluded that this Folic acid, DHA, Lycopene and zinc tablet could improve the quality of life of children with Cancer, especially prostate cancer, mouth cancer. skin disease. It is also useful for development of the central nervous system and also help to maintenance of muscles. We are making superior quality of Folic acid, DHA, Lycopene and zinc tablet. Our offered tablet is processed using high grade chemical compounds by our experienced quality controllers that ensure its quality, purity and chemical properties. Highly treasured among the clients for its reliability, accurate composition, excellent physical and purity, this tablet is offered to our esteemed clients at the market leading prices.